Many problems simply do not exist for wealthy people. But that does not mean all problems disappear when a person has ample assets. Health, occupation and the fortunes of offspring occupy the minds of some extremely affluent investors, and one of the factors determining the level of concern is the age of the investor. Spectrem’s wealth segmentation series study Financial Behaviors and the Investor’s Mindset investigates the personal concerns of wealthy investors to determine what personal matters weigh upon them. 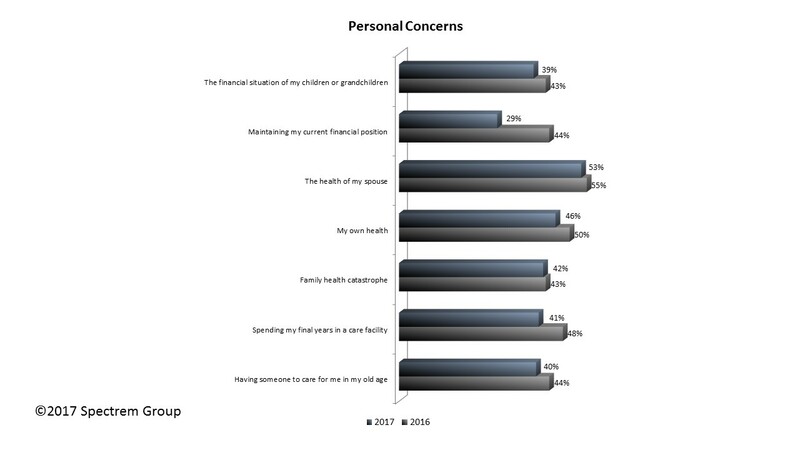 Among Ultra High Net Worth investors with a net worth between $5 million and $25 million, 53 percent express concern over the health of their spouse (only 46 percent express concern about their own health). It makes sense that older investors would be more inclined to be concerned about the health of their spouse, and in fact, 61 percent of UHNW investors over the age of 71 express that concern, while only 50 percent of Millennials and Gen X investors (under the age of 52) are currently worried about the health of a spouse. Among Ultra High Net Worth investors with a net worth between $5 million and $25 million, there has been a 6 percent decrease in the concern over the health of a spouse from 2016 to 2017. Still, it is the greatest concern of the wealth segment. In the case of Millionaires with a net worth between $1 million and $5 million, 53 percent worry about their own health, and 50 percent of UHNW investors do so. That is also widely varied based on age. Outside of the health arena, 53 percent of Millionaires are concerned about maintaining their current financial situation. That is a much higher percentage than what was reported from UHNW investors (44 percent). Among UHNW investors, the concern over finances is lower overall (43 percent) but is actually higher among the younger investors (50 percent among Millennials and Gen X investors). One responsivity which weight upon investors of all ages is taking care of aging parents. Exactly 50 percent of Millionaires and 41 percent of UHNW investors express that worry. Advisors must know what personal pressures beyond finances are weighing upon the minds of clients if t hose concerns have any financial bearing at all. The health issues, for example, can affect the way an investor looks to the future, forcing them to pay more attention to immediate financial needs than far-reaching ones. Likewise, if the concerns expressed deal with the investor’s own health future, with an emphasis on the possibility of living in a care facility someday, advisors must prepare information that could alleviate the financial concerns related to advanced age care.